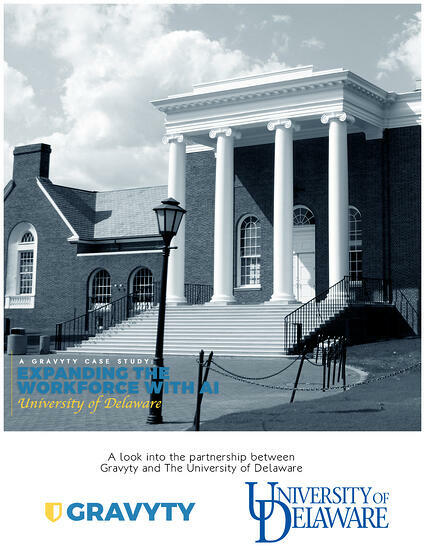 Gravyty, the first and leading provider of AI-enabled fundraising software, today announced that the University of Delaware (UD) has expanded the capacity of its Development workforce by 150 percent by adopting Gravyty's artificial intelligence (AI) fundraising solutions. Full details of UD’s workforce expansion are outlined in a new Gravyty case study, available for download here. The University of Delaware is committed to excellence in undergraduate and graduate education, research, and service. Organized around seven colleges and schools that house 23,000 students, UD's history is long and storied, from its roots as a private academy in 1743. Today, on its Newark, Delaware main campus, students are immersed in the school's state-of-the-art facilities and enriched by world-renowned guest speakers, NCAA Division I intercollegiate athletics, 300-plus engaged student organizations, concerts, and other arts and cultural activities. Additional campuses in Wilmington and Lewes offer expanded opportunities to extend the University’s reach and impact. Before adopting Gravyty's AI-enabled fundraising suite of tools, UD's Development Office was exceeding annual goals. Rather than resting on laurels, Vice President for Development and Alumni Relations, Jim Dicker, chose to ask how the institution could develop more relationships at scale, qualify more pipeline, and increase fundraiser efficiency. He looked to AI and Gravyty for solutions. "Gravyty's AI tools are improving an already successful fundraising process for the University of Delaware," said Dicker. "AI has created efficiencies for my staff to perform at two-to-three times its size, without additional hires. With AI, UD is redefining what's possible in fundraising." For more information on how the University of Delaware is using AI to personalize outreach, build relationships at scale, and expand its fundraising workforce, read our full case study with UD here.